Bind Mender - The Chip's Challenge Wiki - The Chip's Challenge Database that anyone can edit! 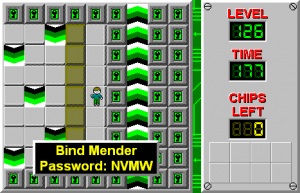 Bind Mender is the 126th level in Chip's Challenge Level Pack 4. It was created by Miika Toukola and originally seen as part of the January 2016 Create Competition held on CC Zone which required building levels using only a limited selection of tiles. 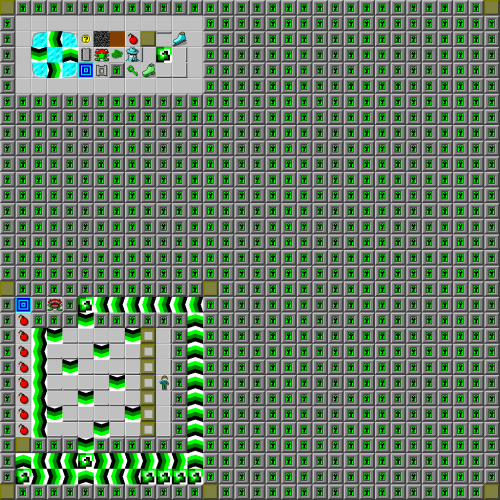 The level has seven blocks that need to be pushed along their own rows into bombs. This objective is fairly clear but is inhibited by force floors that would take the blocks off track if they are not first blocked. Finding the right sequence of when to push blocks forward and how far, is the meat of the puzzle. The level is busted in MS due to slide delay allowing a couple blocks to be pushed over a force floor even without setting up a proper nail. However, if you wish to score the bold you must both have perfect boosting and not get unlucky with the random force floors, which has a 27/64 chance of failure. The Lynx bold route is also one tick away from being a second slower, so you are required to override the random force floors without bumping into walls. All of this is of course by design. There was some controversy leading to the release of CCLP4 with which version of the level to use. The staff felt that the random force floor could lead to annoying deaths, but the designer was unwilling to remove it. A compromise was found where the tile remained but an extra row of force floors was added which allowed for salvaging an unlucky turn of events in casual play.